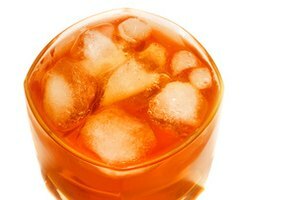 Most people have a tough time telling the difference between whiskey, bourbon and scotch. Whiskey is an alcoholic distilled spirit made from fermented grain and aged in a wood container and can be categorized into three main types: whiskey, bourbon and scotch. Simply put, every bourbon and scotch is a whiskey, but not every whiskey is a bourbon. 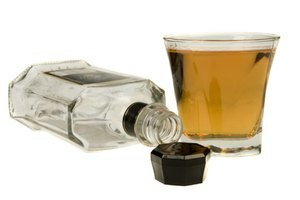 Distilled beverages like whiskey have been around since 800 B.C. in China, but you can also date whiskey's origin back to around 1494 in Scotland. In America, farmers found that instead of trying to transport grains across the country without spoiling, it was easier to ferment them and make alcohol that could be easily stored and transported. In America today, about 400 million liters of whiskey are produced each year. Distillation, fermentation, aging and blending differ by country of origin and the preference of each individual distillery. Nearly all whiskeys are aged in charred, white-oak barrels. Whiskey is made from fermented mashed grains like barley, rye, corn and wheat. Most whiskeys are produced in Ireland, Scotland, Canada and the United States. Scotch and Canadian whiskeys are often spelled "whisky." Canadian whiskeys were originally made from rye, but many distilleries now use corn, wheat and barley. To be called Canadian whiskey, the alcohol must be mashed, distilled and aged in Canada. 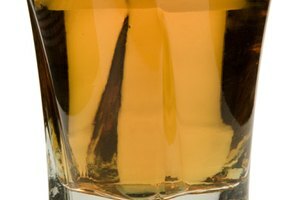 Canadian whiskey is known for its lighter flavor and color than its American counterparts. Popular Canadian whiskeys include Crown Royal, Seagram's and Canadian Club. Bourbon is a classic, American corn-based whiskey. Its name comes from its place of origin, Bourbon County, Kentucky. Bourbon is known as a straight whiskey, meaning it is made from at least 51 percent of a grain, aged in oak barrels and the complete distilled product must exceed 80 proof in alcoholic content. Kentucky was the primary producer of whiskeys in the 1700s and 1800s, and for a whiskey to be a true bourbon it must comply with the federally regulated bourbon distilling code. American bourbons are aged in warm, dry conditions and have a higher alcohol content than other whiskeys. Popular types of bourbon include Jim Beam and Wild Turkey. Scotch whiskey (also called whisky) must be distilled and aged for a minimum of three years in Scotland in compliance with the Scotch Whisky Act. Scotch differentiates itself from whiskey and bourbon in that it is rarely blended — a bottle of scotch typically comes from the same single batch and has not had anything added to it. Scotch is aged in cool, wet conditions, so the whiskey becomes less alcoholic as it absorbs water. 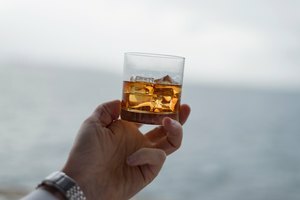 Non-blended, or single malt, scotch is meant to be enjoyed without a mixer, while blended scotch is often used in mixed cocktails.